Background: There is an enormous health burden caused by the co-prevalence of tuberculosis (TB) and tobacco use in India. This intervention study was undertaken in district Vadodara, Gujarat, India to promote tobacco cessation by integrating 'brief advice' for tobacco cessation in TB patients who were tobacco users and registered for treatment under TB control programme, based on the tested strategies advocated by World Health Organization (WHO) and the International Union against Tuberculosis and Lung Diseases (The Union). Materials and Methods: Brief advice for tobacco cessation based on five A's, advocated by the WHO and the UNION was incorporated into the on-going TB Control programme in India in the year 2010. The tools were developed for education, training and capturing data. All the registered TB patients receiving directly observed treatment short-course (DOTS) who used tobacco in any form were offered brief advice during routine interaction for treatment. Results: A total of 46.3% of TB patients, predominantly males (89.6% males and 10.3% females) were current users of tobacco; 39.1% used smokeless tobacco, 35.9% were smokers and 25% were dual users, that is, smoked as well as used smokeless tobacco. At the end of treatment, of the 67.3% patients who were offered brief advice, quit tobacco use, 18.2% re-lapsed while 14.5% were lost to follow-up. Conclusion: A significant numbers of TB patients use tobacco with adverse impact on TB control programmes. Our study shows that it is feasible to introduce 'brief advice' strategy as a cost effective intervention for tobacco cessation among TB patients with careful monitoring. This paper looks at the possibility and outcome of integrating 'brief advice' for tobacco cessation in tuberculoses patients who are registered for treatment under TB control programme and are tobacco users. In the year 2010, Tobacco Control Division and Central TB Division in the Directorate General of Health Services, Ministry of Health and Family Welfare, India, discussed and decided to co-ordinate the potential of introducing tobacco cessation within RNTCP on a pilot basis. Two districts were chosen to undertake the project, Vadodara in Gujarat and Kamrup in Assam, where both RNTCP and National Tobacco Control Programme (NTCP) are under implementation. The project discontinued in the Kamrup district due to un-avoidable circumstances and hence this paper considered the project interventions in the Vadodara district of Gujarat only. All confirmed TB patients registered for DOTS in Vadodara district from October 2010 to June 2011 were included in the study. In addition to all TB-related information on TB treatment care; the tobacco use, both smoking and smokeless by the TB patients, types of tobacco products used, details of brief advice and the final outcome on the status of quitting smoking or tobacco use at the end of treatment was recorded in the TCI card, which was attached to each TB treatment card. All patients who were current smokers and users of smokeless tobacco were offered brief advice on tobacco cessation by the DOTS provider and the same advice was repeated during each interaction with the TB patients during the treatment period. The tobacco users were assisted with counselling to quit tobacco use, emphasizing the association of TB and implications of continuing tobacco use on the disease and treatment outcomes. No pharmacological treatment was advised. All the patients receiving DOTS were also given the patient information brochure to educate them on the harms of tobacco use, its association between their disease and treatment outcome and advantages of quitting tobacco. The status at the end of TB treatment was taken as the outcome of intervention by 'brief advice'. If the patients reported not using tobacco at the end of treatment period, it was taken as 'quit' status. If the patient stopped using tobacco during treatment at any point of time but was using tobacco at the end of TB treatment, it was taken as re-lapse. The patients who did not report their tobacco use status or the same was not recorded by the DOTS provider in the respective TCI card were considered lost to follow up. The cost incurred on trainings, development of training material, data sheets and pamphlets was about US $ 7000 for the entire study duration and was borne by the RNTCP regular funds. No extra resources were provided for the project. A total of 2879 TB patients, 1986 males (69%) and 893 females (31%) registered for DOTS treatment during the study period-urban (51.5%) and rural (48.4%). Category wise, 68.9% patients were new cases of TB and 31% were previously treated. Overall 81.7% patients suffered from pulmonary TB and rest 18.3% had extra-pulmonary TB. Of those who suffered from pulmonary TB, 71.2% were males and 28.8% were females. The extra-pulmonary group had 59% males and 41% females. A total of 46.3% of TB patients were current users of tobacco (1333 out of 2879), 52.8% did not use any tobacco at the time of the study. Among the current tobacco users, 89.6% were males and 10.3% were females; 40.8% tobacco users belonged to urban areas and 52.2% were from the rural areas. In keeping with the general trend of tobacco use, the number of TB patients who used smokeless tobacco exceeded that of smokers. While 35.9% of the TB patients were smokers, 39.1% used smokeless tobacco. In fact almost one-fourth of them (25%) were dual users, that is, they smoked as well as used smokeless tobacco. Among the smokers, bidis were used predominantly (86.8%), followed by cigarettes (7.95%), others (3.77%) and hukka (water pipe, 1.46%). The smokeless tobacco users used gutkha (64.6%), followed by Paan with tobacco (betel quid, 18.75%), Khaini (15.6%) and others (0.9%). Tobacco user TB patients were explained about link of use of tobacco and causation of TB. When asked about their willingness to quit tobacco use at the time of registering for anti-TB treatment, 61.9% males and 54.3% females expressed their willingness to quit. 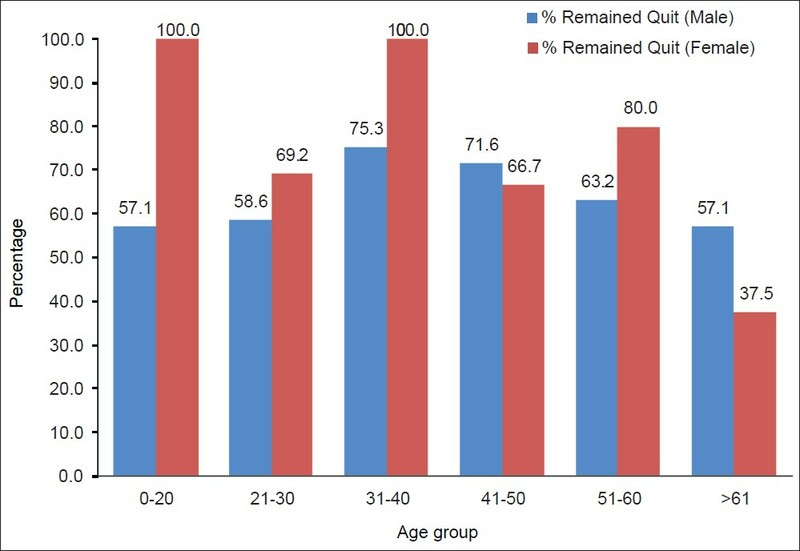 Age wise distribution of those TB patients who were willing to quit tobacco use is shown in [Figure 1]. All registered TB patients who used any form of tobacco (smoking and smokeless) patients were offered brief advice every time they came in contact with the DOTS provider. The average number of times TB patients were offered brief advice before they quit tobacco use is shown in [Figure 2]. At the end of 6 months, 67.3% patients who were offered brief advice quit tobacco, while 18.2% re-lapsed and 14.5% were lost to follow up. [Table 1] gives the age wise distribution of patients who quit, re-lapsed or were lost to follow up. Highest number of patients who quit was in the age group 31-40 years while highest number who re-lapsed was in the age group 21-30 years. 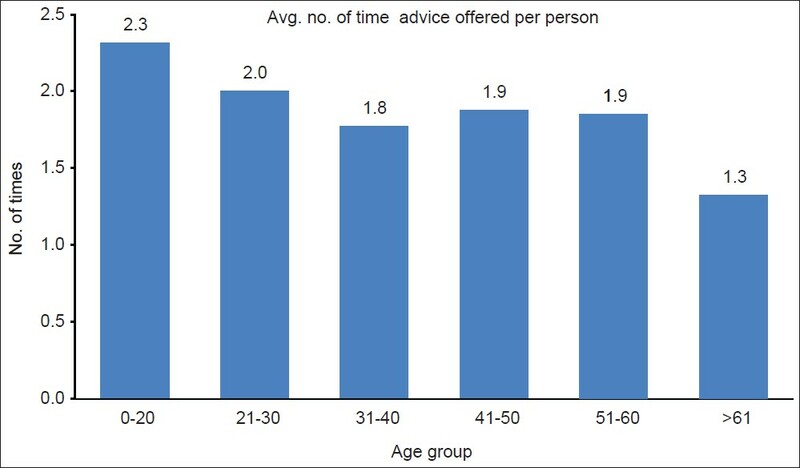 [Figure 3] shows age wise and gender wise distribution of patients who were tobacco users and quit tobacco use following 'brief advice' and remained quit at the end of treatment. In all the age groups, the proportion of females who quit tobacco at the end of 6 months of treatment was higher compared with men, except in the age groups 41-50 years and above 61 years age group. Even the existing evidence on the advantages of TCIs for TB patients and advocacy by the WHO and the UNION have not led to countries integrating brief advice for tobacco cessation in TB control programmes. Thus, there is ample evidence to suggest the larger advantages of offering brief advice to TB patients to improve the treatment outcome and decrease mortality from TB. The encouraging results of the present study provide a good model to extrapolate in TB control programme not only in India but also in other countries facing the challenge of high burden to tobacco and TB. Moreover, as the use of smokeless tobacco is high in India, the opportunity was used to provide brief advice not only to TB patients who were smokers but also to those using smokeless tobacco. The same is evident from the results of the case study. Likewise, the recognition of association between TB and tobacco epidemics makes it imperative to carefully consider exposure to tobacco cessation in efforts to reduce not only the risks of TB and overall mortality resulting from TB but also the decline in health cost burden. It is time that these cost effective interventions are integrated into routine and ongoing national TB control programmes. Training of DOTS providers in 'Brief advice' for tobacco cessation can easily be incorporated in the existing trainings under RNTCP. An important aspect of the present case study is that no extra physical and financial resources were required for the intervention as the infrastructure of existing programmes was used optimally with remarkable co-ordination and collaboration of TB and tobacco control programmes at the national and state level. The confirmation regarding quitting of tobacco use was subjective assessment based on the self-statement by the patients. It was not validated by performing tests such as urine cotinine or carbon monoxide analysis of breath. 1. Pai M, Mohan A, Dheda K, Leung CC, Yew WW, Christopher DJ, et al. Lethal interaction: The colliding epidemics of tobacco and tuberculosis. Expert Rev Anti Infect Ther 2007;5:385-91. 2. World Health Organization. WHO report on the global tobacco epidemic. Geneva: WHO; 2008. 3. World Health Organization. WHO report on the global tuberculosis control Geneva: WHO; 2008. 4. Siddiqi K, Lee AC. An integrated approach to treat tobacco addiction in countries with high tuberculosis incidence. Trop Med Int Health 2009;14:420-8. 5. World Health Organization. Global tuberculosis control-surveillance, planning, financing: WHO report. Geneva: WHO, 2008. Available from: http://www.who.int/tb/publications/global_report/2008/download_centre/en/index.html [Last accessed on 2013 May 3]. 6. World Health Organization. Global tuberculosis control 2010. Geneva: WHO; 2010. 7. World Health Organization. The global burden of disease: 2004 update. Geneva: WHO, 2008. Available from: http://www.who.int/healthinfo/global_burden_disease/GBD_report_2004update_full.pdf [Last accessed on 2013 May 3]. 8. Government of India, Ministry of Health and Family Welfare. TB India 2011: Revised national TB control programme: annual status report. New Delhi: MOH and FW, March 2010. Available from: http://planningcommission.nic.in/reports/genrep/health/RNTCP_2011.pdf [Last accessed on 2013 May 3]. 9. Government of India, Ministry of Health and Family Welfare. Global adult tobacco survey India: 2009-10. Mumbai: IIPS; 2010. 10. World Health Organization. Global report: Mortality attributable to tobacco. Geneva: WHO; 2012. 11. Prasad R, Suryakant, Garg R, Singhal S, Dawar R, Agarwal GG. A case-control study of tobacco smoking and tuberculosis in India. Ann Thorac Med 2009;4:208-10. 12. Pednekar MS, Gupta PC. Prospective study of smoking and tuberculosis in India. Prev Med 2007;44:496-8. 13. Gajalakshmi V, Peto R, Kanaka TS, Jha P. Smoking and mortality from tuberculosis and other diseases in India: Retrospective study of 43 000 adult male deaths and 35 000 controls. Lancet 2003;362:507-15. 14. Leung CC, Li T, Lam TH, Yew WW, Law WS, Tam CM, et al. Smoking and tuberculosis among the elderly in Hong Kong. Am J Respir Crit Care Med 2004;170:1027-33. 15. Sitas F, Urban M, Bradshaw D, Kielkowski D, Bah S, Peto R. Tobacco attributable deaths in South Africa. Tob Control 2004;13:396-9. 16. World Health Organization. A WHO/The union monograph on TB and tobacco control: joining efforts to control two related global epidemics. Geneva: WHO, 2007. Document No. WHO/HTM/TB/2007.390. Available from: http://www.who.int/tobacco/resources/publications/tb_tobac_monograph.pdf [Last accessed on 2013 May 3]. 17. Udwadia ZF, Pinto LM. Why "Stop TB" is incomplete without "Quit Smoking". Indian J Chest Dis Allied Sci 2011;53:9-10. 18. Slama K, Chiang CY, Enarson DA. Tobacco cessation interventions for tuberculosis patients. A guide for low-income countries. Paris: International Union Against Tuberculosis and Lung Disease, 2008. Available from: http://www.ghdonline.org/uploads/Tobacco-and-TB-Guide.pdf [Last accessed on 2013 May 3]. 19. Slama K, Chiang CY, Enarson DA. Introducing brief advice in tuberculosis services. Int J Tuberc Lung Dis 2007;11:496-9. 20. Government of India, Ministry of Health and Family Welfare. Revised national tuberculosis control programme: DOTS-plus guidelines. New Delhi: MOH and FW, 2010. Available from: http://health.bih.nic.in/Docs/Guidelines-DOTS-Plus.pdf [Last accessed on 2013 May 3]. 21. Government of India, Ministry of Health and Family Welfare. National tobacco control programme. New Delhi: MOH and FW; 2012. 22. Peto R, Chen ZM, Boreham J. Tobacco: The growing epidemic. Nat Med 1999;5:15-7. 23. Schneider NK, Novotny TE. Addressing smoking cessation in tuberculosis control. Bull World Health Organ 2007;85:820-1. 24. Basu S, Stuckler D, Bitton A, Glantz SA. Projected effects of tobacco smoking on worldwide tuberculosis control: Mathematical modelling analysis. BMJ 2011;343:d5506. 25. Awaisu A, Nik Mohamed MH, Mohamad Noordin N, Abd Aziz N, Syed Sulaiman SA, Muttalif AR, et al. The SCIDOTS Project: Evidence of benefits of an integrated tobacco cessation intervention in tuberculosis care on treatment outcomes. Substance Abuse Treatment, Prevention, and Policy. 2011; 6: 26. Available from: http://www.substanceabusepolicy.com/content/6/1/26 [Last accessed on 2013 May 3]. 26. Wang J, Shen H. Review of cigarette smoking and tuberculosis in China: Intervention is needed for smoking cessation among tuberculosis patients. BMC Public Health 2009;9:292. 27. Safa M, Tabarsi P, Sharifi H. Pattern of tobacco consumption among TB patients in a Tuberculosis Referral Center. Tanaffos 2011;10:50-5. 28. Novotny TE. Smoking cessation and tuberculosis: Connecting the DOTS. Int J Tuberc Lung Dis 2008;12:1103. 29. van Zyl Smit RN, Pai M, Yew WW, Leung CC, Zumla A, Bateman ED, et al. Global lung health: The colliding epidemics of tuberculosis, tobacco smoking, HIV and COPD. Eur Respir J 2010;35:27-33.